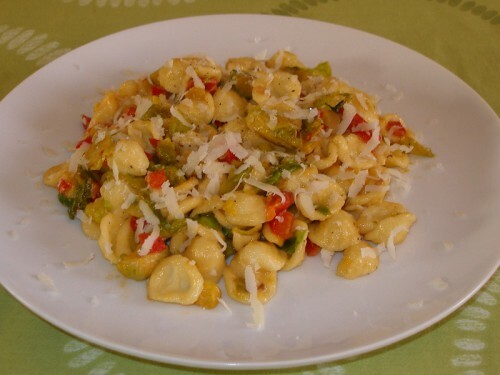 Orecchiette, literally “small ears”, are a type of thick small pasta that is particularly good with sauces containing strong flavoured vegetables, like Brussels sprouts and broccoli. If you can find it, I recommend using pecorino Romano cheese in this recipe. It’s a very salty and sharp sheep cheese that is used on pasta dishes in a similar way as Parmigiano cheese. Once opened, it lasts for months in the fridge, so you don’t have to worry about wasting any if you buy it for the first time for this recipe. Serves 3-4 as a main course, 4 as a first course . Wash the Brussels sprouts and quarter them. Wash the bell pepper, remove the stem and seeds, and cut it in big cubes. Heat the olive oil in a big pan (it needs to fit all the ingredients, including the cooked pasta) on medium heat with the whole garlic gloves. When hot, add the sprouts and the pepper. Fry for 4 minutes stirring often. In the meantime, start cooking the pasta according to the instructions on the package; it should take about ten minutes, but it varies depending on the pasta brand. While the pasta is cooking, add the cream and a few spoons of hot water from the orecchiette pan to the vegetables and cook on low heat until the vegetables are cooked but still crunchy (6 or 7 minutes). If the vegetables get dry while cooking, add some more water. If the vegetables are ready before the pasta, just turn off the heat. Drain the cooked pasta and add it to the vegetables. Turn the heat back on and cook for a minute, adding more hot water if the pasta gets too dry. Add salt and pepper, and cook for a minute. Serve the pasta with plenty of grated pecorino cheese on top. This entry was posted in first courses, main courses, quick and tagged bell peppers, brussels sprouts, cream, orecchiette, pasta, pecorino by Marco Barisione. Bookmark the permalink.